"This book is written for the manager who wants to make their company more flexible, more competitive, more successful, and a more satisfying place to work--what we call the High Performance Enterprise. It explains how this kind of enterprise can be created through two interrelated processes: one strategic and one people-oriented...[U]ntil now, no books have simultaneously provided (1) a process for creating the High Performance Enterprise, and (2) a process for linking the people side of the company to the business strategy. Our goal is to do both, and to provide a model for tying both processes together. Whether you're skimming this book for a few good ideas or seeking a complete battle plan, we hope that you will find in these chapters the tools you need to change your company into a High Performance Enterprise." --from the Introduction In today's fast-paced, rapidly growing business environment, survival truly does depend on being the fittest. For companies, this means performing at the highest level possible to be more flexible, more competitive, and ultimately, more successful than the rest of the field. Attaining--and maintaining--peak performance may be easier said than done, however, as bold initiatives once thought to be the answer have fallen short of expectations and yielded less than stellar results. What, then, is the solution? 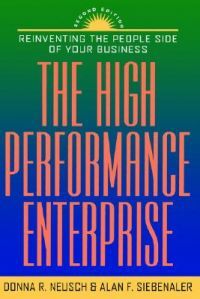 In The High Performance Enterprise--now completely revised and expanded--management consultant Donna Neusch and operations manager Alan Siebenaler shed some much-needed light on the ongoing dilemma of improving performance and sustaining long-term standards of excellence. For the past several years, companies have strived to change the way work is performed and business is conducted, trying everything from TQM, teams, and Kaizen to QFD, right-sizing, and activity-based costing. Yet, despite these various techniques, results have been less than managers have hoped. Why the shortcomings? In most cases, the reason has been that people systems, including work design, compensation systems, and team structures, have either been ignored, ineffective, or counterproductive--costly mistakes that need to be corrected if a company is to succeed. The High Performance Enterprise, Second Edition emphasizes the crucial role of people systems in the overall performance improvement program, examines its relationship with another important component--strategic direction--and shows you how to tie them together seamlessly to achieve optimal results. With complete details on both subprocesses, you'll learn about key concepts that are integral to strategic direction, such as mission, values, and vision, as well as the basics needed to turn this direction into action. To help you strengthen and reinvent the people side of your business, you'll find a proven 10-step process that incorporates managing performance and compensation, defining flexibility and teams, developing staffing strategies for future skills, and planning for implementation, among other fundamentals. Packed with helpful case studies, numerous real-world examples, and practical applications from the field, The High Performance Enterprise, Second Edition offers new solutions for age-old problems: how best to improve performance and increase return on compensation dollars. Essential reading for all managers. DONNA R. NEUSCH is a partner with Davis & Neusch, Inc., a strategic compensation consulting firm located in Richardson, Texas. A PhD in educational psychology and a Certified Compensation Professional, she is experienced in designing and implementing people systems. ALAN F. SIEBENALER, formerly a partner with Millennium Management Tools, held top-level positions at GTE and Bell Labs where he managed operations and product development.